You may have read how absurdly awesome April is going to be, but can you believe it keeps getting better? Believe it. 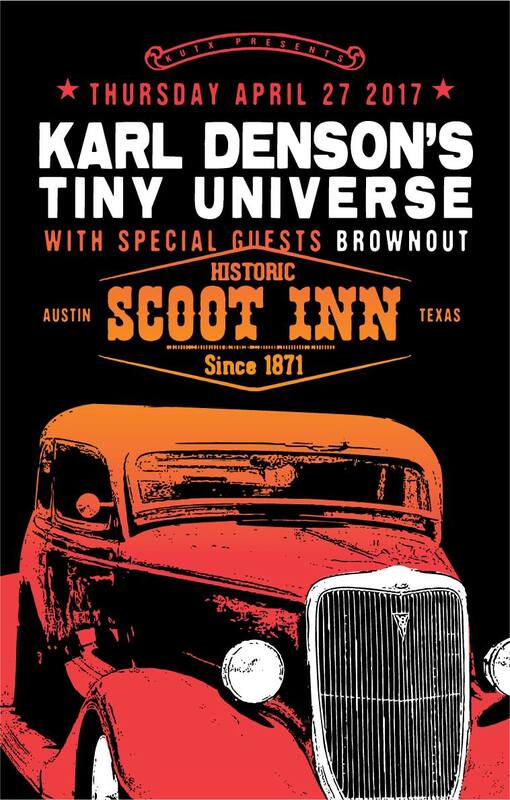 Karl Denson’s Tiny Universe will be jamming at Scoot Inn on April 27 for their Runnin with the Deisel tour with special guest Brownout. KD’s Tiny Universe brings a sound so funky you can smell it, so if you’re into that kind of thing, (e.g. anyone I saw at Lettuce or Galactic late last year) get yourself there! This, a week after Umphrey’s McGee plays Stubb’s. Just two day before Trey Anastasio Band plays Stubb’s. Between the recent additions of Karl Denson’s Tiny Universe and a late night set by Sunsquabi (April 15th at Empire Control Room & Garage), it is undeniable that there is just something with Austin this April. Will it get even better? Very possible. We can only daydream – .moe at Stubb’s? Disco Biscuits at Emo’s? Widespread Panic?? Excuse my musing – none of those things are happening. Not yet, anyway. But at the rate and magnitude these April shows are piling up, does it really sound so far-fetched? What’s your Super-Secret Festie Schedule?